The posts will be less frequent now that build season is over but don't think that means we haven't been working. We have been working every day to improve our shooting and doing driving practice. We are also still developing our hanger. We know how it works; we don't have a graceful implementation that will let us go under the pyramid and still hang for 10. We'll have something made up for Lone Star but it'll probably change throughout the season. A couple things that have happened recently. 1. We were selected to receive a grant from National Instruments to support our team. We're very happy to have the support of such an awesome organization that supports FIRST in so many ways. 2. Our mentor Allen Gregory was on Stafford TV for our role at the Houston Mini Maker Faire. You can watch the clip here. This weekend we are very busy. 1. Ultimate Ascent starts tomorrow there are events around the country and one in Lubbock. Many of our friends (3310, 1296, 2848, 2468, 16, etc.) will be competing there. We're very excited to see the game played for the first time and we wish all the teams competing this weekend the best of luck. We'll be watching webcasts and checking results from all the events. 2. Tomorrow we will be at the Houston Society of Materials Engineers conference spreading FIRST to as many people as we can. Our plan is to invite all of these engineers back to George R. Brown next week for the Lone Star Regional. 3. Saturday we are running the last leg of the Houston ISD VEX Robotics League. We'll finally crown a champion. We'll have a lot of students on hand volunteering as always. We ref, MC, score keep, queue, etc, pretty much all of it is handled by Spectrum students. 4. Preparations for Lone Star. We are finalizing our Chairman's presentation and video, working on the practice bot and getting driver practice (floor collection is amazingly fast). We are putting together our gift bags for the other teams. We are organizing tools and preparing the pit stuff, getting our spirit items together, and putting together our scouting system. There is a lot going on and not much time to finish it. Today was our open house, Spectrum Showcase, for parents and friends to come see the robot that we spent six weeks building. It was fantastic event. We were building/troubleshooting at show time so some of the parents had the chance to see the team work together to do some problem solving and building on the fly. The first ever power up was at 6:10 for an event that was supposed to start at 6pm. We found a bad PWM cable and a new problem with the Victor 888s that we had to solve. We also had to do a very fast Jaguar swap. All that was happening while The Box was being mounted on the lift. We still have some problems to work, but for a first test Gamma Ray performed well. The drive train is solid and the lift is working well. Collection is still our best system, any disc we drive into gets sucked up into The Box. The lift is working far better now after all the tweaks. We have to move on to small changes on the shooter to make firing faster and more reliable. We have 2+ weeks with the practice robot to get the wrinkles ironed out before Lone Star on March 7th. We also want to thank all the teams that came to our Week 0 practice. 57, 441, 2585, 2882, 3335, and 4589. You all were awesome and we can't wait to see on the field at Lone Star. We would especially like to thank 2587, the Discobots, for co-hosting the event with us. We hadn't done much testing of the tilt mechanism until today. It still needs work but it's at least closer than it was yesterday. We'll have surgical tubing helping it balanc,e but the 100:1 versaplanetary and BAG motor are working perfectly for this application. We would like to thank FRC#3310 Black Hawk Robotics for making us the 1/2" hex shaft coupler that allows the tilting mechanism to be so simple. The robot is actually on our scale in that video. As shown we are only 85lbs, we still have about 10-15lbs to add but we're still going to be easily 20lbs underweight. Here is a view of the robot with the lift fully extended and the shooter box tilted up. This is about our ideal shooting position. We're working on replacing all of our lift cross bars because the intial sheet metal version were twisting too much. We have 1.5"x1" aluminum rectangular extrusion that will be replacing them tomorrow to make them more rigid. The competition robot begins assembly tomorrow. We should have him running by Monday for our open house. Things are looking up again. The solution from yesterday was tested today and it worked perfectly. Here's a video of our floor collection tests. We made some improvements to the lift. Moving to #25 chain instead of #35 seems to make it run smoother. We're getting some twisting in the cross bars so we may have to find a better way to reinforce them or replace them with a stronger shape. We're limited on space which is why they were made so small to begin with. The competition robot is still getting pieces and parts made for it and we should be able to start final assembly in the next few days. Today was spent mostly making pieces for our competition robot. We also had to swap out some rollers on our drive train. We're still having a few lift issues and testing more proposed solutions. It works - it just does not work as well as we would like right now. The shooter/collector is collecting much better and the paddle is shooting out upside down and right side up discs. We should have the parts back and powder coated tomorrow so we can finally begin assembly of the competition robot. We also have drafts of our Chairman's essay, executive summary, and presentation put together. We still have to edit them, but they are very close to complete. We were able to put on the pop-up can opener hanging device today. It's still in prototype form but we managed to get directly over the center of gravity on the first try. I guess the CADed weights are right after all. We did some more changes to the lift to get it more stable and faster top to bottom. We still aren't finished working all the bugs out, but we're getting closer. Currently, it actually likes going up way more than going down. This was the opposite problem from yesterday. The shooter/collector is collecting well; we still will have some more changes once we get on the actual robot. Drive train was having an issue where one side would stall while going very slowly in reverse. We think we found the cause and should have a solution implemented tomorrow. This is our first year doing the prototype/practice robot 1st. 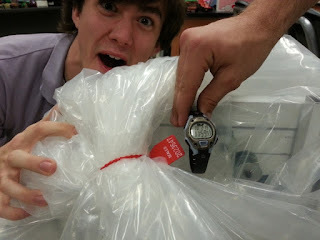 We'll only have 8 days to put together our competition robot. We have most of the parts made and they should be back from powder coating on Monday. Don't forget to come to our Week 0 Practice if you are going to be in the Houston area next weekend. We're down to the last two weeks of the build season. We still have lot of problems to solve, but that's what makes this game so much fun. We're working on the outer pieces of the robot that will mount the 10 point hang device. We are replacing the lift chain guides with a better system which should reduce some of the load on the lift. We don't have the shooter parts back from the shop yet, so we are at bit of a stand still on this until we get them. We're also planning to powder coat the competition robot if we can get it done in time. We're hosting the Houston Week 0 Practice at our school this year. For more information head over to CD. Only two weeks left till we stop building. This is going to be a close one for us. 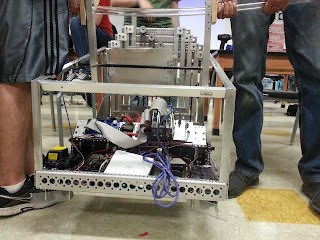 We have a mostly working practice robot, but we are still waiting on sheet metal to make it complete. Our goal is to have the real robot parts powder coated by the middle of next week and then it's a mad dash to the finish line before bag day. For more discussion about the collector/shooter and lift video from Sunday night look at this CD thread. We worked on improving the stability of the lift today. There are still some problems but lots of solutions as well. The collector/shooter is our most critical piece that we will be getting back from Solarcraft Inc. this week. We still don't have an elegant design for the 10 point hang yet. We understand the concept and requirements, we just have to package it nicely into our robot. “The best way to honor someone who has said something smart and useful is to say something back that is smart and useful. The other way to honor them is to go do something with what you learned. We're still testing the systems. The lift is a little wobbly going up and we're also still trying to dial in the right amount of reduction we need on the lift motor. We got in a couple electronic solenoids from Allied Electronics today that we may be using for pin breaks in our gearboxes and/or to release a few spring based mechanisms like our hanging device. We did some more shooter testing; the collector works fine with upside down Frisbees, but the current shape of our paddle doesn't like pushing them into the shooter. We're confident that most of the discs will be face up during the match. It's the last 30 seconds we're worried about, but we are confident we can find a shape that works for both disc orientations. Our 1st annual Super Bowl Bumper Build was very successful. We had 5 teams in attendance (4155, 4280, 4346, 4639, and 4689). It was nice to get to work with so many awesome teams on getting our robots competition ready. We're looking forward to hosting one of these again next year. Thank you to FRC #4280 (N-gen from Sam Houston MSTC) for providing bumper fabric and pizza to all the teams. We have been more hush hush this year about our design than last. We have shared a few things, but the actual strategy hasn't been publicly revealed until now. Watch the video for our prototype tests. You should be able to get an idea of what we are doing. Here is a recent CAD Model of the robot. It's not complete by any means. A lot of things have and will be changing, but we think we are going down a pretty solid path right now. The lift raises and lowers the "The Box" (shooter/collector) from the floor to 76+" from the ground. We're planning on shooting from as close to the goals as we can be. 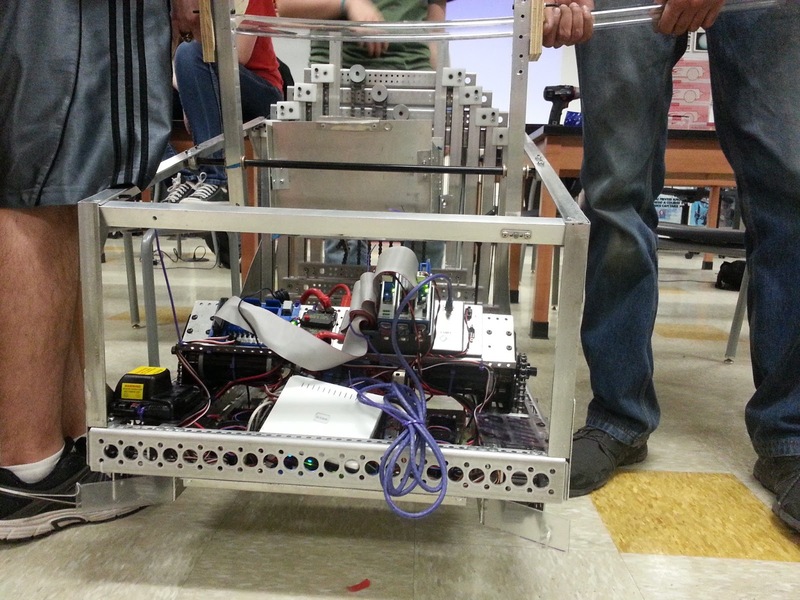 The lift is not for climbing (yet) we will have a 10 point "Can Opener" hang somewhere on the robot to begin with. We're hoping to get the sheet metal shooter parts back early this week. From there it's actual driving floor pickup and raised shots. We have two weeks till bag day and a little over a month till our first competition (Lone Star 4/7-4/9). 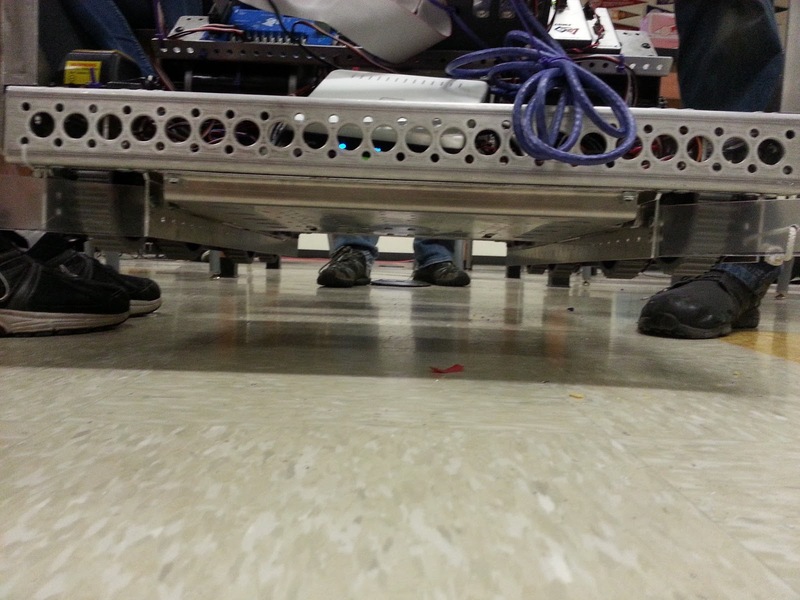 We were able to test the drive train and other key pieces of our robot. They aren't perfect, but we can make them better. Not much of an update tonight because we'll have video in tomorrow's update. Tomorrow is our Super Bowl Bumper Build. We're really excited to have 5 teams joining us at our school to get our robots ready for competition. All our meetings are long, but today's was extra long, leading into an even longer weekend. We received our first run of sheet metal form Solarcraft Inc. They have been fantastic about working with us and helping in any way that they can. We have pieces for the both the real robot and our practice robot + a couple spaces in case we damage something. With the pieces we received we were able to wire most of the practice robot's drive train. We still need to mount the cRIO and run PWM cables before we can start driving it but that should be taken care of tomorrow afternoon. We also started putting together a lexan version of our shooter since we just sent the sheet metal parts off to be made and we aren't sure when we will get them back. Tomorrow we should have a few videos to post and show off more of our robot. Last year at this time we had a working (driving and shooting) robot. This year we don't even have a superstructure on top of our robot. We did get our parts back from the CNC router at TX\RX Labs. They are the white pieces in the picture. The rest of what this goes on should be revealed in the next few days, once the first parts come back from the sheet metal shop. We are working on designing more of our parts to be less sheet metal since our turnaround times are a lot slower than we expected. We did have Team 4689 from Royal High School here today to talk about programming challenges. We ended up moving them to Java because they had students that sort of knew Java already and were struggling to learn LabVIEW. It's nice that teams have options so they can find something that works for them. They'll be back this Sunday for the Super Bowl Bumper Build.